As fall approaches, I'm already thinking about Thanksgiving pie (or maybe I'm just thinking about pie because pie makes me happy)! 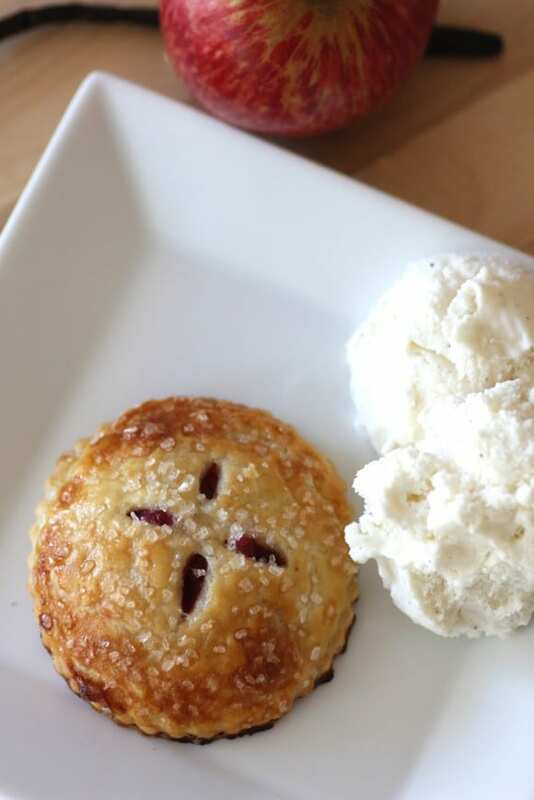 I wanted to make single serving pies that would work at a dinner party or Thanksgiving celebration. 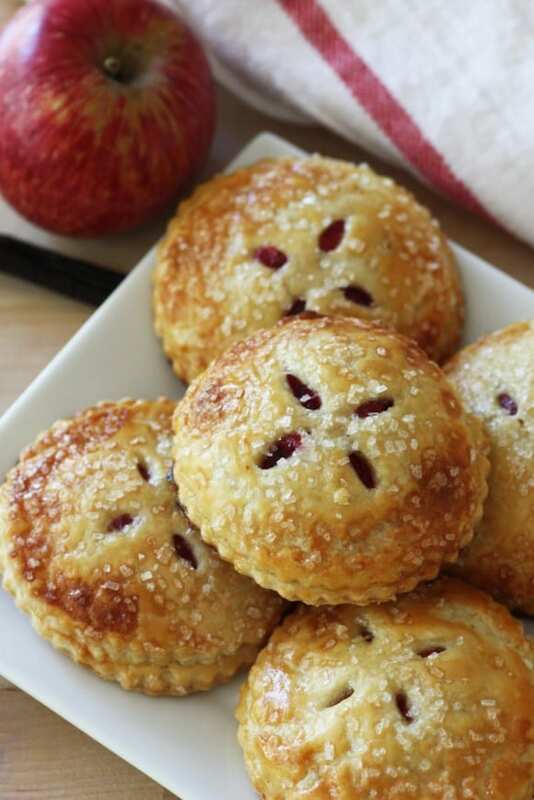 These cranberry apple mini pies are simple (even the crust is easy), come out looking beautiful, and are so sweet, tangy, buttery, flaky, and delicious, your guests will love them! 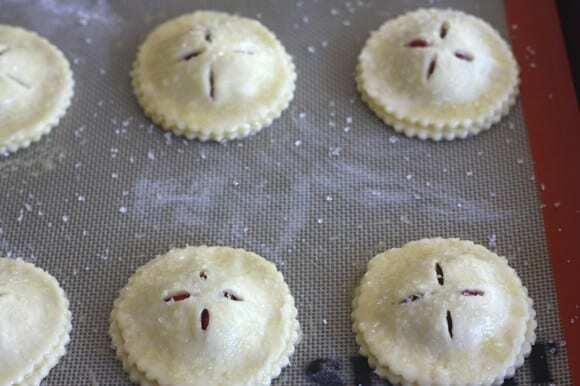 Start by preparing the dough for the pie crust. If you want to use pre-made crust, you can skip ahead, and probably finish the whole recipe in about 20 minutes. But crust is pretty fun to make. The main trick to making a pie crust using butter, is keeping it as cool as possible while you make it. I store our flour in the freezer, and about 15 minutes before we start, I also put the mixing bowl in the freezer. Cube the butter, and put it in a food processor with the flour, salt, and sugar. Mix for about 30 seconds. It will have almost a breadcrumb texture. Pour into the chilled mixing bowl. If you don't have a food processor, you can do this by hand in the mixing bowl. Use a pastry cutter or your hands to blend the butter. Add 1/4 cup of the cold water, and mix it with your hands. I like to grab and twist, making sure to work the bottom and sides of the bowl. When the water is absorbed, add another 1/4 cup of cold water. That should be enough to pull the dough together. 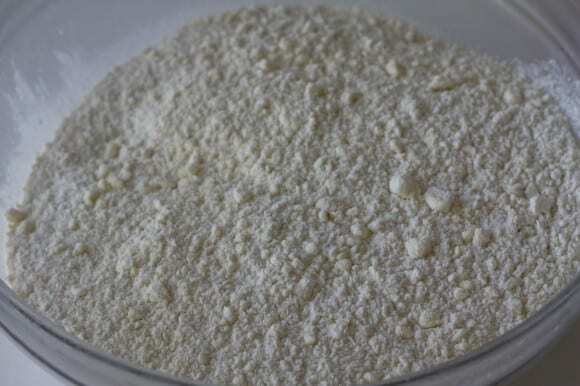 If it still seems crumbly like in the picture below, work in another couple tablespoons of cold water. Sprinkle some flour on your work surface and knead the dough just a couple times to work into a nice smooth ball. 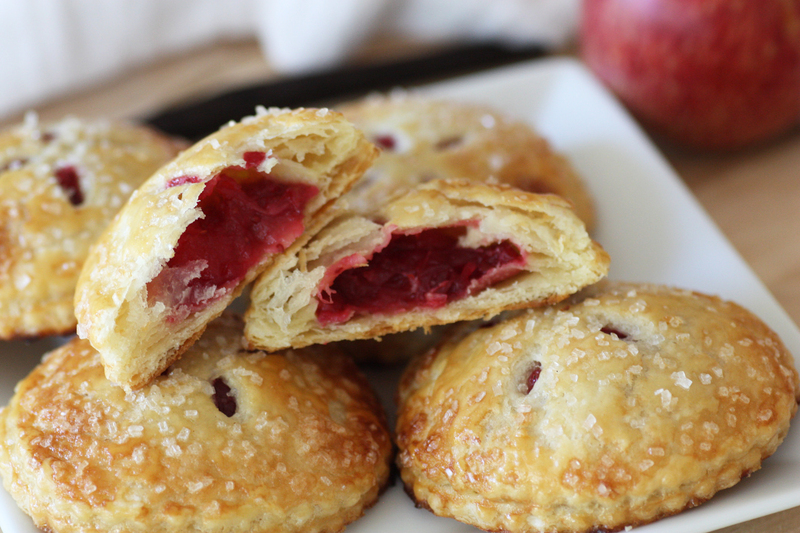 Cover it in plastic wrap, and put it in the fridge for at least 30 minutes to rest while you work on the filling. Add the cranberries to a saucepan over medium heat. I don't add any water because I want a thick filling. Stir occasionally, and when the berries start to pop, you can add 1/2 cup sugar, and the orange zest. 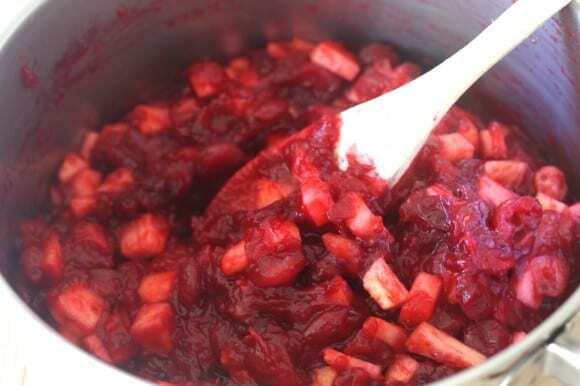 Let it simmer on medium-low heat for about 15 minutes until you get thick jam like texture. Peel and core the apples, and dice them. 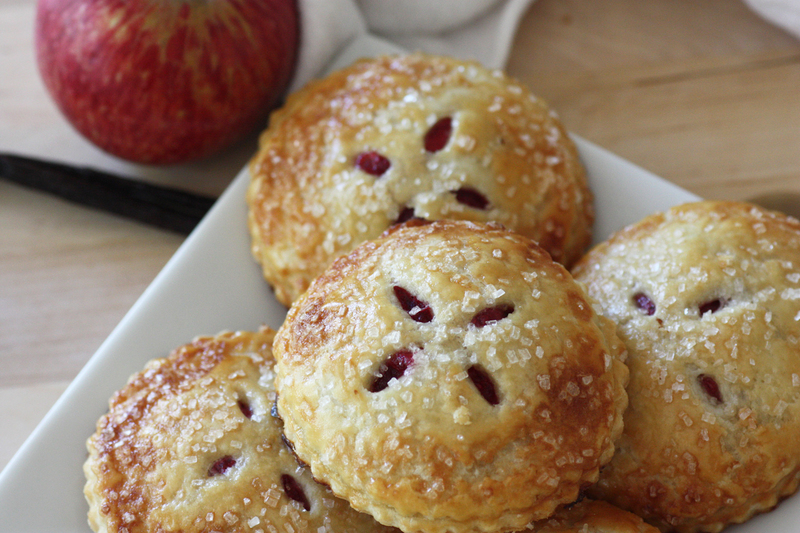 Take the cranberries off the heat, and stir in the apples. 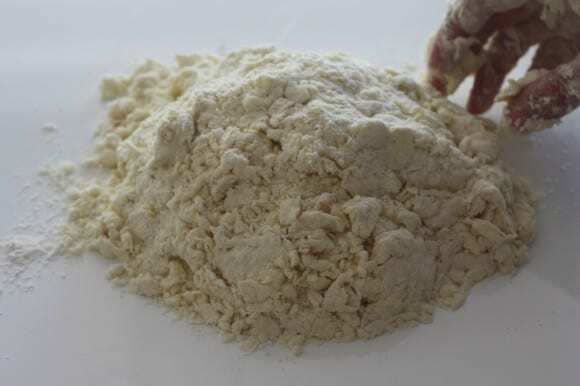 Take the dough out of the fridge, sprinkle some more flour on your workspace and roll it out to about 1/16th of an inch thick. 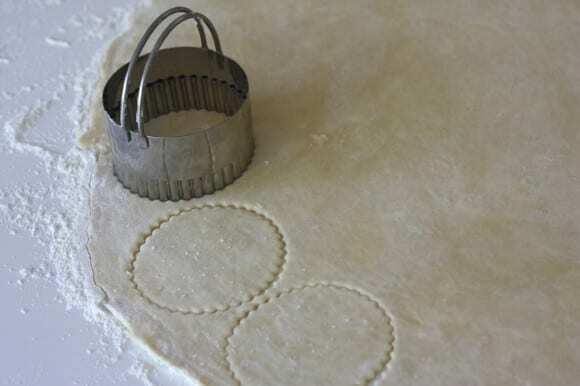 I use a 3 inch biscuit cutter to cut two pieces of dough for each pie (top and bottom). You could also cut it into 3 inch squares with a knife. 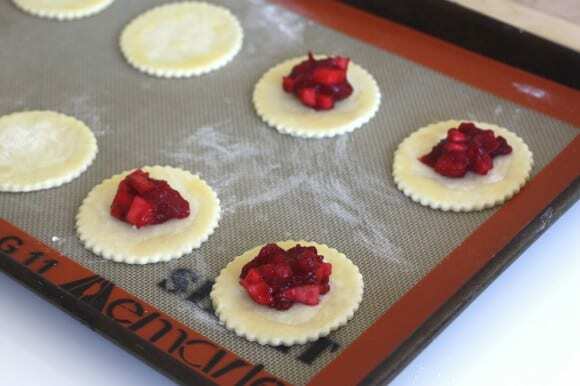 Put the bottom pieces on a baking sheet covered with parchment paper or a silpat. Make your egg wash by beating the egg and adding 1 tablespoon of water. 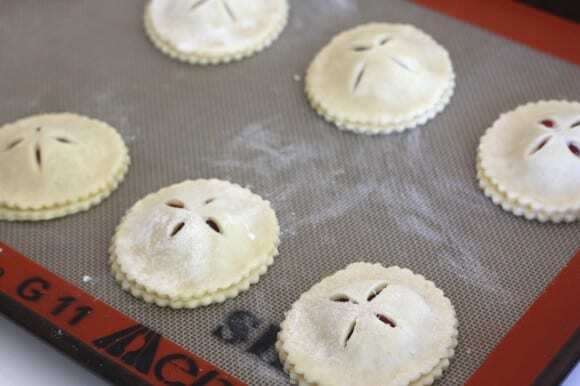 Brush around the perimeter of the bottom pieces to help seal the pie. Spoon about a tablespoon of filling into the center of each bottom piece. Cut an "X" into the center of each top piece, then lay them over the bottom pieces, gently pressing the edges all the way around to seal. Brush the whole top with the egg wash, then generously sprinkle sanding sugar over the top. Bake for about 15 minutes, until golden brown. Let them cool before eating, and be careful of the hot, but delicious filling! And definitely serve them with ice cream!! Those look gorgeous! I love how they look with the coarse sugar. 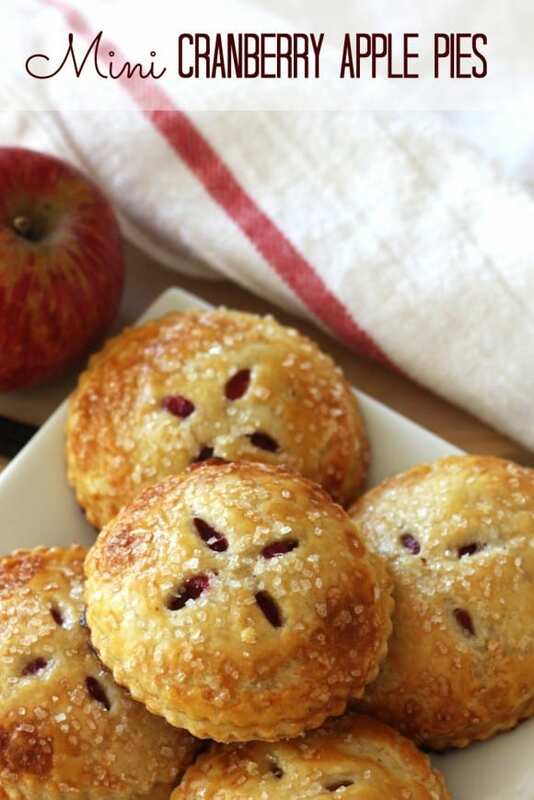 So cute and I'm sure they are delicious, too! Great recipe. I would love to try this when doing my party plan. Thank you! How far in advance can I make these? Thank you! 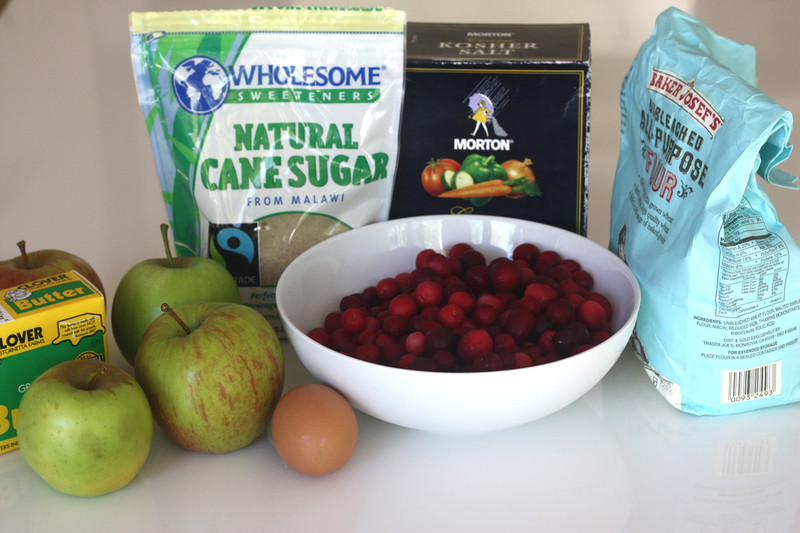 Could I substitute raspberries for the cranberries? Do you think it would change the recipe in any way? Thank you! Can these be made and frozen?